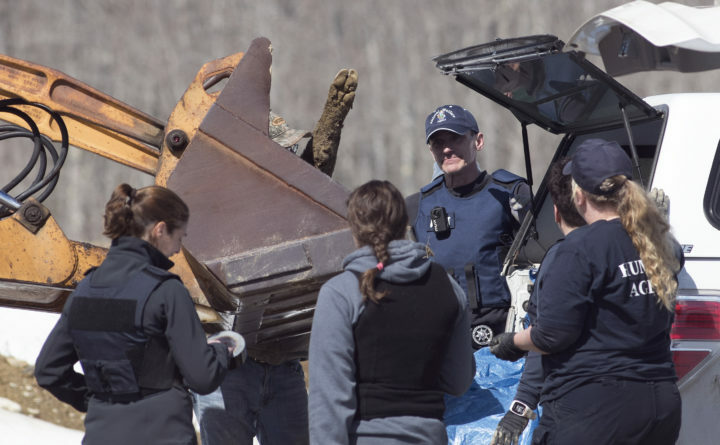 Maine Animal Welfare Agents removed pig carcasses from Ireland Hill Farms in Swanville as they executed a search warrant at the farm in March. A Swanville farmer has entered a plea of not guilty to 13 counts of cruelty to animals charges filed after state animal welfare officials exhumed a dozen Mangalitsa pigs that he allegedly shot, killed and buried on his property a day before the agents were scheduled to check on them. A clerk at Belfast District Court said on Thursday that farmer Jerry Ireland’s attorney had entered the plea on his client’s behalf, and so the arraignment that scheduled for Friday, May 25 would not happen. The charges were filed against the farmer in early May, more than a month after Maine Animal Welfare Program agents descended on Ireland Hill Farms with shovels and a backhoe to dig up the pigs. A few new details about the poor condition of the dead animals and the single live pig the state agents found that day also have been made public through court documents. 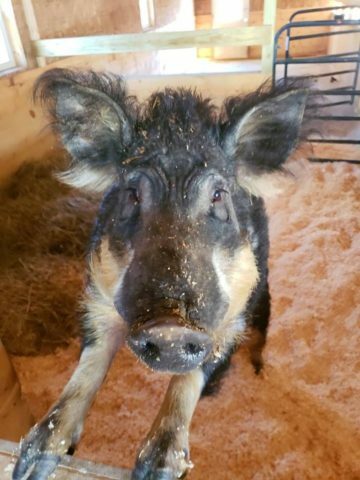 Angus, a Mangalitsa pig seized from Ireland Hill Farms by officials from the Maine Animal Welfare Program, has gained 65 pounds since arriving at Peace Ridge Sanctuary at the end of March. On March 28, agents who came to the farm found a single live pig locked in the barn without food or water, according to an affidavit and request for possession order dated April 3 by Rae-Ann Demos, a district humane agent with the Maine Animal Welfare Program. They also found a cow roaming the property that had access to a barn “full of manure and wet soggy bedding,” she wrote. While the pig did appear to have fresh bedding, she wrote, its body condition was not good. On a body condition scoring scale of one to five, with one being emaciated and five being obese, the live Mangalitsa was estimated to be 1.3, she wrote. In the stall next to the pig, agents found a pig’s lower jaw carcass lying on the ground. After doing a walk-through of the property, the agents began to dig in the area where pigs reportedly had been buried the day before they got there. Agents gave those carcasses body condition scores between one out of five and two out of five, and noted that one of the pigs seemed to have been dead longer than the rest. That pig was “gutted” and had a “nauseating” smell of decomposition, she wrote. Three of those pigs were selected to be sent for a necropsy, and a femur from one of the animals was removed on site to have a “femur fat analysis” done, she wrote. Analyzing the fat in femoral bone marrow can help support a diagnosis of malnutrition or starvation. The team then moved to a second suspected burial site and found the carcasses of two small pigs which were sent to the University of Maine for a necropsy to be performed, she wrote in the affidavit. The agents also seized the live pig and took it to a licensed rescue facility. At a possession hearing in early May, Ireland agreed to rescind his ownership of the pig, which Maine Animal Welfare Director Liam Hughes said would be found a good home. That home is at the Peace Ridge Sanctuary in Brooks, where founder and operations manager Daniella Tessier said Thursday that the pig she calls Angus is doing well and receiving lots of care, nutrition and belly rubs. “He came in emaciated, full of parasites, including topical lice — no excuse for that,” Tessier wrote in an email to the BDN, adding that Angus has gained more than 65 pounds since he was removed from Ireland Hill Farms at the end of March. When she read that Ireland said he was feeding his pigs primarily potatoes, hay and forage, but did not want to feed them grain, she thought something sounded off. Ireland has been embroiled in a long-running dispute with the state’s animal welfare division over the treatment of his livestock. An Army veteran, Ireland also is the chief executive officer and president of the nonprofit group United Farmer Veterans of Maine. Animal Welfare Program officials have said Ireland was not cooperative with their agents and ignored their phone calls and refused visits and inspections. They believe his decision to shoot and kill the animals on the eve of an inspection was an effort to hide evidence of inadequate care. But state law says that euthanizing one’s own animals in Maine is not a crime if it’s done humanely, which likely will be an important distinction as the criminal case moves forward. Ireland’s attorney, Hunter Tzovarras of Bangor, told the BDN in early May that Ireland did treat all the animals on his farm humanely. He said that the charges really stem from a dispute with the state over how to properly care for Mangalitsa pigs, a specialized breed that is not common or well-understood in Maine.